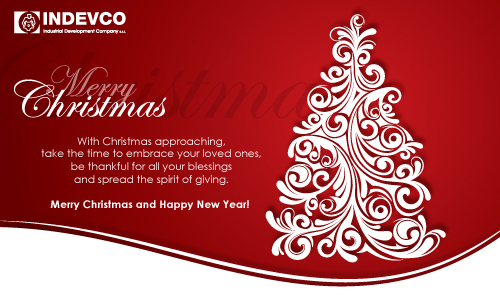 In line with INDEVCO Group mission to care for the community, Masterpak distributes gifts during the holidays to spread family spirit. Masterpak, for the fifth consecutive year, practices its annual tradition to spread holiday cheer and give back to the community. 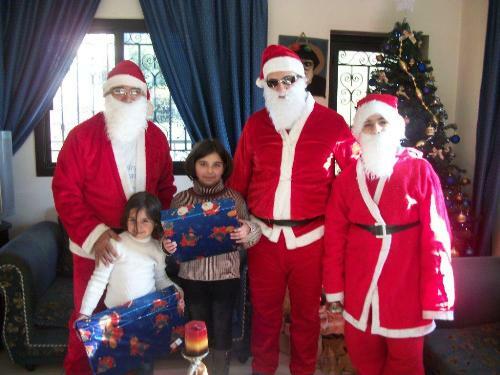 On 18 December 2011, Masterpak team members joined together, dressed in Santa costumes, to visit 20 homes from Beirut to Tripoli and distribute gifts, clothes and food to 35 children. 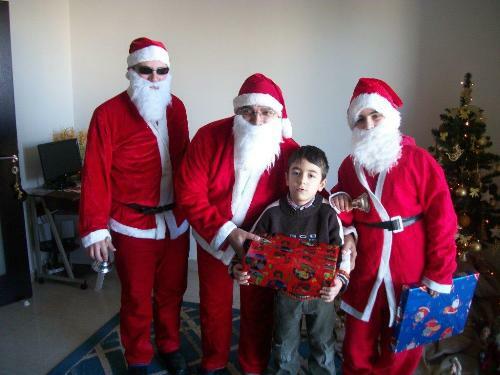 This year Masterpak also distributed gifts to adults as well. 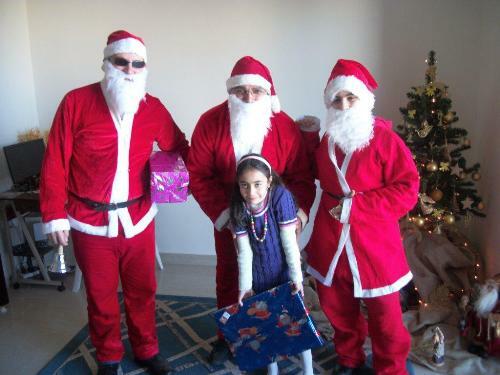 The Lebanese polyethylene (PE) film manufacturer in Zouk Mosbeh aims at bringing happiness to families during the holiday season and inspiring others to take part in the spirit of giving. Read all about the latest developments at Masterpak, Lebanese polyethylene (PE) film manufacturer in Zouk Mosbeh, in the REACH newsletter of Q4 2011. 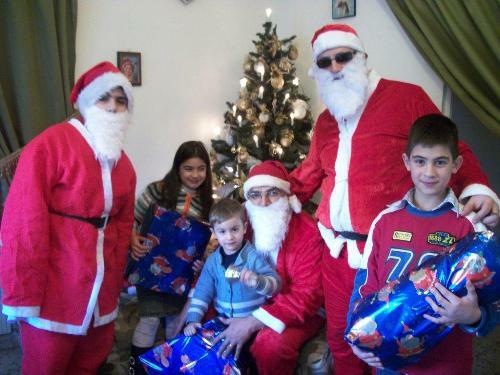 December 2011 Masterpak REACH newsletter discusses Masterpak’s new products and key international exhibitions Masterpak partook in, including IndAgra 2011 in Romania and Le Liban en France 2011 in Paris. GREENCOATâ website (www.greencoat.net) makes requesting information and samples of wax-alternative corrugated boxes easy for packaging buyers in the poultry, meat, seafood, fresh produce, floral, and landscaping industries. Interstate Container has released a website for GREENCOATâ wax-free boxes, a corrugated packaging solution for companies in need of strong and sustainable moisture-resistant corrugated packaging. Interstate Container Cambridge and Interstate Container Columbia ship over 3.2 million wax-alternative boxes each month. The boxes are compostable and FBA-certified 100% recyclable and repulpable. From the website, visitors can call or submit a quick form to request GREENCOATâ samples to run in side-by-side trials with their current packaging. The website also offers PDF downloads, links to upcoming trade shows and to social media channels. GREENCOATâ boxes provide the same strength than traditional cascaded wax boxes and curtain coated wax boxes. They withstand high exposure to moisture, rough handling, long storage, transportation, and shifts from cold-to-hot environmental conditions. GREENCOATâ boxes are also easier to glue than waxed boxes. Interstate Container controls 100% of GREENCOATâ’s manufacturing process; the company does not outsource the coating of paper to third parties, which increases cost effectiveness. Likewise, customers experience cost savings, when they no longer have to pay landfill disposal fees. Interstate Container Cambridge invested 5 years of R&D to develop and successfully trial GREENCOATâ wax-alternative boxes with leading poultry processor, Mountaire Farms. GREENCOATâ has reduced an estimated 100,000 tons of greenhouse gases for Mountaire Farms, lowered costs and streamlined Mountaire Farm’s supply chain. Interstate Container has received awards for GREENCOATâ and for its contributions to its local communities. Dorchester Chamber of Commerce named Interstate Container Cambridge 2011 Large Chamber Business of the Year for its good standing with obligations and active support of the community and chamber activities. At the 11th Annual Sustainable Design Awards, Global Green, a non-profit organization dedicated to fostering global climate improvement, awarded 1st Pioneer Award to Interstate Container for its advancements with GREENCOATâ. Mountaire Farms and WMDT, ABC-affiliated television station in Salisbury, MD, named Interstate Container Cambridge as the recipient of the WMDT/Mountaire Farms Environmental Star of the Month Award for July 2010. Interstate Container is a member of Delmarva Poultry Industry, Global Green Coalition for Resource Recovery (CoRR), North Carolina Poultry Federation, Produce Marketing Association, and Sustainable Packaging Coalition. Jeddah-based flexible paper packaging manufacturer, Multipak, offers German and European market eco-friendly, vivid, 2-layer cone sleeves with an aluminum outer layer and an inner paper layer. ISEGA, acknowledged and registered German testing laboratory, analyzed Multipak’s printed and glued ice cream cone paper and foil laminate and confirmed compliance with European quality and food safety standards. The product assessment tested whether Multipak ice cream cone sleeves can safely come in contact with food products without changing taste or chemical composition. The thorough testing process ran over 25 days from 10 November – 5 December 2011. The assessment results are consistent with Multipak’s quest to continuously meet internationally-recognized quality standards. ISEGA has the accreditation of Deutsche Akkreditierungsstelle (DAkks) and Deutsche Akkreditierungssstelle Chemie (DACH), national accreditation bodies for the Federal Republic of Germany. Multipak manufactures and prints 2-layer ice cream cone sleeves in up to 8 colors, using flexographic or rotogravure printing. The visually appealing flexible packaging solution uses eco-friendly raw material. The inner paper layer, certified by FSC/PEFC ‘Chain of Custody’ (CoC), originates from sustainably managed forests. Furthermore, tested to be drip-free, the aluminum layer of Multipak’s ice cream cone sleeve prevents water penetration and holds the lid in place. Read more about Multipak ice cream cone sleeves. Multipak meets internationally-recognized quality, safety, and legal requirements. The Saudi-manufacturer is certified safe for food contact by British Retail Consortium (BRC/IoP) and Hazard Analysis and Critical Control Points (HACCP). Furthermore, Multipak has passed Nestlé and Yum! thorough international supplier audits and met strict safety standards. Multipak produces and supplies ice cream cone sleeves, as well as ice lolly push-up packaging to Australia, Europe, the Far East, Middle East and North Africa (MENA), and North America. The manufacturer also produces paper bags, paper sheets, and paper cups. Interstate Container will display eco-friendly corrugated wax-replacement packaging at Southeast Regional Fruit & Vegetable Conference. 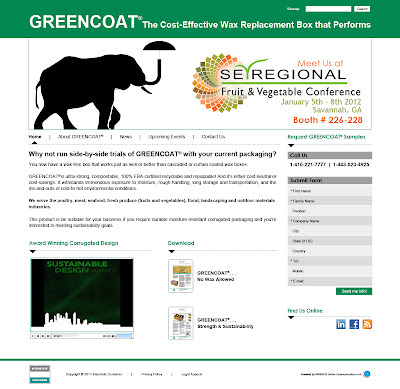 Interstate Container plants in Cambridge, MD and Columbia, SC will exhibit GREENCOAT® boxes for packing fresh produce at SE Regional Fruit & Vegetable Conference 2012, Booth # 226 & 228 in Savannah, GA. The annual event from January 5 – 8, 2012 is the largest educational conference and trade show in the southeastern US for fresh produce growers, packers, vendors and suppliers. Interstate Container representatives attending the event include Jeff Cormier, National Sales & Marketing Manager, Frank Bridges, National Produce Account Manager, and Elyse Cristos, Sales Representative. Attendees can gather information about environmentally friendly GREENCOAT® corrugated boxes. GREENCOAT® is a compostable, FBA-certified, 100% recyclable and repulpable packaging solution for transporting products that require durable moisture-resistant corrugated packaging. The wax-free corrugated box, developed by Interstate Container Cambridge team and successfully trialed by Mountaire Farms, packs such products as fresh produce, floral products, poultry, meat, and seafood. Mountaire Farms is a Delaware-based poultry processing company. SE Regional Fruit & Vegetable Conference 2012 will gather over 2,200 producers, buyers, sellers, decision makers and industry leaders in the fresh produce sector. The event addresses food safety, production practices and increased yields, marketing strategies, and how to improve crop production and grow business. Attendees of the event will find new products and services on the trade show floor, as well as learn about the latest produce trends and legislative updates from Washington, DC. “Yum!" re-approves Unipak as corrugated pizza box supplier to Pizza Hut, a "Yum!" top restaurant brand. Unipak passed the Yum! Quality Assurance Audit and Food Safety re-audit on 23 – 24 November 2011. The food safety certification was originally received in December 2010. Mahmoud Sallam, Yum! certified Food Safety & Quality System Auditor, conducted the two day audit. The corrugated packaging manufacturer meets the high quality and food safety standards, in line with its on-going strive for excellence in quality and management systems. “In today’s packaging world, we are witnessing an increasing need for harmonized certification in food safety systems especially amongst global players such as Yum! brands. As part of Unipak's continuous development strategy in the food and catering packaging sector, the company has recently obtained the Yum! certification with excellence. This certification ensures justified confidence that all necessary measures are taken to guarantee food safety throughout the different links of the supply chain. Furthermore, this certification has helped us, not only gain accessibility to new multinationals and geographic markets, but also have the highest industry standards in the area of pest control, sanitation, operations and facility management, good manufacturing practices and product protection, as well as recovery and food security. In addition to pizza boxes, Unipak manufactures other corrugated packaging for the catering sector, such as cup carry-out trays, double-decker pizza boxes, single serve takeout boxes, and takeout boxes for meals. Yum! selects suppliers based on the industry-renowned Supplier Tracking and Recognition (STAR) system. The audit system focuses on key focal points: good manufacturing practices and product protection, operations and facility management, recovery and food security, pest control, and sanitation. Yum! searches for suppliers that demonstrate excellent performance in food safety and security practices, as well as quality control in management processes.